Clearing closets of clutter is one of the most often-overlooked aspects of feng shui decluttering. While this may seem like a trivial point when it comes to the rest of your home, closets filled with clutter can have just as much impact as an open room with piles of clothes and other items. Any time you have a closet overstuffed and disorganized, it prevents valuable auspicious chi energy from flowing unobstructed through your home. The rest of your home can be the perfect feng shui design, but if the closets are a disorganized mess, your feng shui application is far from being sufficient. The chi energy won't be able to get past the accumulation of clothes and various items in the closet. Clutter creates stagnant chi and becomes an obstacle to new chi entering your home. The overall effect of a cluttered closet to an otherwise feng shui home is like working all day in the garden and donning fresh clothes without taking a shower. If you're experiencing repeated bouts of illnesses or a slow but steady decline in your health, these could be symptoms of a cluttered closet. Difficulties and obstacles at work may have you perplexed over the root cause, analyze your closets as the possible culprits. 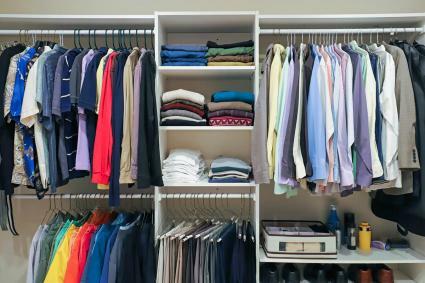 Your income and wealth may be slowly but consistently decreasing as a result of the impact of disorganized closets. If you've noticed more frequent arguments in your family, it may be time to reorganize your closets. A feeling of unrest and discomfort may be prevalent when chi energy becomes stagnant due to overloaded closets. While the foyer closet might be smaller than the other closets in your home, don't underestimate its impact. The foyer is where chi energy first enters your home. It is vital that this area be free of clutter, so chi energy can move into the rest of your home. If you haven't paid attention to organizing the foyer closet, stop what you're doing and tackle it immediately. A packed and disorganized foyer closet becomes an obstacle that prevents chi from entering your home. A portion of that energy pools around the closet, leading to stagnant chi energy. Clutter in a foyer closet impacts every aspect of your life since it robs valuable chi energy from each area of your life. The bedroom is a haven for rest and rejuvenation. If the chi energy becomes stagnant around your closet, it can impact the quality of your sleep. You should keep this closet organized and clean at all times to ensure other areas of your life aren't impacted. The linen closet is a highly used storage area that is often not kept organized and neat. This closet is often located in the bathroom for convenience. The bathroom already has a bad rep since clean water enters but inauspicious waste water leaves this room. A messy linen closet adds to the negative impact the bathroom has on the household, so it's vital to keep this closet tidy. A hall closet often becomes a catchall for everything you can't or don't want to store in other closets. The hall serves as a passageway for chi energy to travel. If this avenue has stagnant chi, it can block the chi energy and cause it to pool in the hallway. This blockage can deny other areas of the house from receiving auspicious energy. If cluttered, this closet should be reorganized and kept neat at all times. If you have a storage closet in the basement or garage, you may think its utilitarian purpose makes it exempt from being classified as clutter if disorganized. This simply isn't true since any form of clutter is inauspicious and creates stagnant chi energy. The obstacles these areas create can prevent you from achieving goals such as a promotion, getting a loan or avoiding conflicts. Clean up this closet, too. 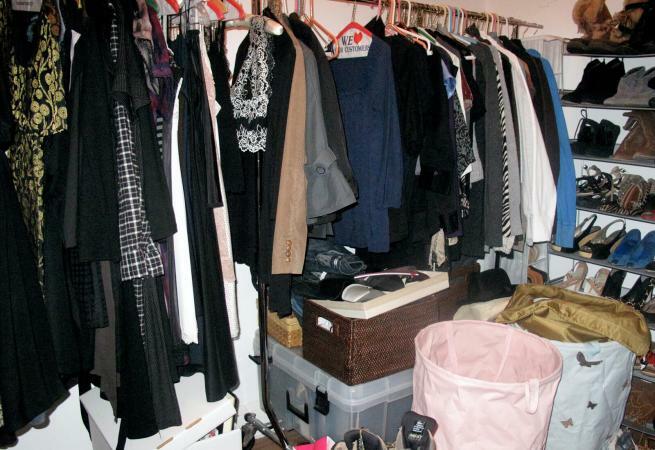 Depending on the sector where your unkempt closet is located, specific areas of your life can be affected. For example, if the closet is in your southeast sector, then your wealth can be harmed by this kind of closet issue. A north sector located closet can influence your career situation in a negative way. If you're having a specific issue, it could be as simple as cleaning out the closet in that sector and organizing it. The immediate sensation you'll have once the closets are clean and organized will be like a breath of fresh air. You'll be able to sense the freeing up of stagnant chi energy and see an improvement in the negative impacts you've experienced as a result of having cluttered closets.